Made like a tank and so easy to put together I did it myself. I am a 50 + y/o 5'3" female with no skills in that department but was able to put it together with relative ease. Highly recommend this shelving unit and cannot wait to replace current shelving units with Gladiator units. The shipping box was beat to hell but the rack was without a mark. 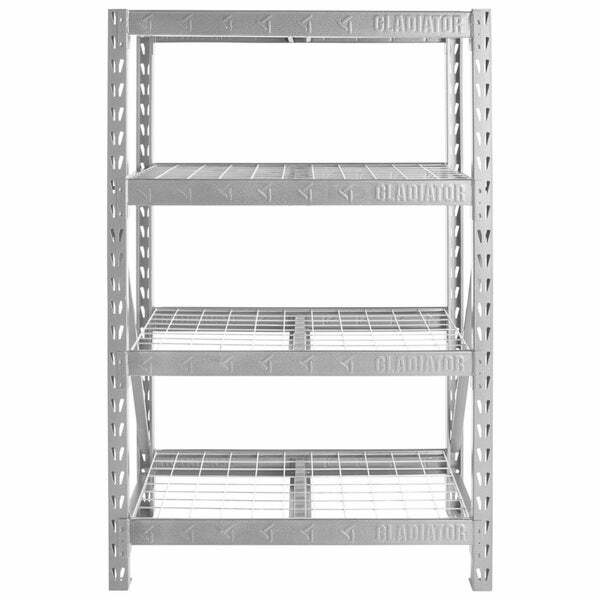 This heavy-duty steel rack shelving unit allows you to store and organize all of your large and bulky items. It's built with a welded steel frame and four robust shelves that each hold up to 1,500 lbs. Plus, it's fast and easy to assemble at home without any tools, and the dual slot design allows for additional supports and shelves. While other manufacturers make claims about weight capacity, strength or durability, Gladiator brand proves it with some of the industry's most rigorous testing regiments to ensure unsurpassed performance in any environment. Dimensions 18.0 In. X 48.0 In. X 72.0 In. Fast delivery, the item is great strong, I am so happy, thank you guys, I recommend .